15 Chapters have passed and on this last 5 chapters while the story didn´t progress too much overall, we got some character development and answers regarding the past of Kazuma Shouji. So lets check it out! You can check other Cardfight!! Vangaurd G: NEXT Articles here. This Chapter is basically a continuation of the last one where Chrono hasn´t been able to contact with Kazuma, they even lost the tournament at Card Capital 2 due to the fact that their team was incomplete; at the same time Jaime Flowers team won, so Tokoha, Kumi and Enishi are now Under 20 participants! Now due to a misunderstanding Chrono ended up being beaten and taken to a weird place where a gang likes to roam, they think he is Kazuma Shouji, that pretentious child who thinks is the big thing. Chrono decides to play along, and then it has come that the gang leader is a former national competitor of Vangaurd, so he has experience in this game. Suddenly Kazuma appears and clears the misunderstanding; but still the fight will be done and if Kazuma looses, Chrono´s deck will be destroyed. Chrono believes in Kazuma and both Kazuma and the gang leader enter in a fight… A Vanguard fight. The match is good, and I liked a lot of the moves that Kazuma did. At the same time we got to knew more about Kazuma´s past where it seems he was an adopted son or something like that, in any case he was not so loved in this family of his… One that put the winning above all else, and the fact that no matter how much he tried, or how much he won awards, seconds places or honorary mentions at anything (Sports, Studies,etc)…Those things never make a dent to his Father, especially because he has a brother who well, trump at everything and always defeating him in everything… Including Vanguard, so no matter what he did he would always loose. Still Kazuma hasn´t lost hope and for that even in the face of adversity he will continue now! No more forfeiting! No more backpedalling! Kazuma does some amazing moves and , obviously, wins! After that the police has come since Taiyou, who found Chrono´s location, has called them. A little later, Chrono tells Kazuma to go the next weekend to Card Capital 1. They will go to the tournament in there and win! Taiyou and Chrono have reached Card Capital 1, the last place they can go in order to enter the tournament. They wonder if Kazuma is going to show up, still… Chrono believes in him. In there it seems that the Trinity Dragon guys have made quite famous for being very strong players, thing that’s hard to believe for Chrono; but oh well. The tournament is about to start and after a little chat with Mizaki and Kamui, they are allowed to participate without Kazuma IF they are able to win their first 2 matches, ergo, if a third match comes and Kazuma hasn´t appeared then… They will be disqualified. In any case the Tournament starts and both Chrono and Taiyou are doing al right, so they don´t need Kazuma… Until the finals comes, and their opponents are the trinity dragon team, the shinning stars of Card Capital 1, while they are the jokers of Card Capital 2. The first match is between Taiyou and the guy who uses dimensional police (forgot the name, sorry). The match is good and it seems that the Trinity Dragon trio has become truly amazing players, so if it wasn´t so obvious. Taiyou lose. Thankfully Kazuma presented, it seems he just was left asleep because he was investigating new ways to play his cards. In any case the second match starts and the things go on equal grounds, still Kazuma won´t give up! The Chapter starts where the past left off. Kazuma keeps fighting against the guy with “Brock eyes” who uses great nature (forgot the name). The abilities of both warriors are extremely good. Kazuma starts remembering his past; but not only that he has a new resolution, a new resolution to help both Taiyou and Chrono, to make them go to the U20! He is part of the Striders now and he will continue no matter what, that´s why this time he won´t lose and he won´t back down either! 1.- They truly took seriously to improve their game and for that they won the respect and the ability to the Card Capital 1 players, including various veterans of the original series like Miwa and Naoki. 2.- They wanted to defeat Chrono fair and Square. Now the match continues, and Chrono is able to pull a victory somehow since it didn´t came easily. Now Team Striders is in the Under 20 competition! This Chapter was a very relaxing and funny one where we see how the 3 teams: Striders, Fukuhara´s Vanguard Club and Jaime flowers are enjoying their time before the grand tournament. Striders.- They go to eat some truly spicy Curry, at a restaurant challenge because if they win, it is say that they can win at everything!... The things looks is not going so well for them BTW. But in the end they manage to win and also had free tickets for an amusement park! Jaime Flowers.- The group (plus their Coach Jaime) went to a Onsen and started relaxing with everything that it is in there. Jaime tries and fails to bring a smile to Enishi´s fails; but Ok. Tokoha remembers Gabriel and how now she has inherited his will and she is decided to win, not only for his memory; but for herself too. The Day of the tournament comes and new teams are presented which includes; but not limited to: Striders, Jaime Flowers, Fukuhara´s Vangaurd Club, Heaven and Hell (Kamui and his Waifus Nagisa and emi- Aichi´s Sister), Rumy Labyrinth (the G Idols: Saya and Rumy Labyrinth) ,etc. Also the past champions are in there as well… Team diffrider, leading by Kazumi… Kazuma looks at Kazumi, a weird smile is formed on his face, that person is… None other than his step brother, the one he was never able to beat. The Tournament starts and both Ibuki and Mamoru teaches the rules for the first stage which will be a battle for points where the players will fight to another people for points and the first 16 in getting 50 will advance to the next match. There are other rules; but they are more or less complicated. 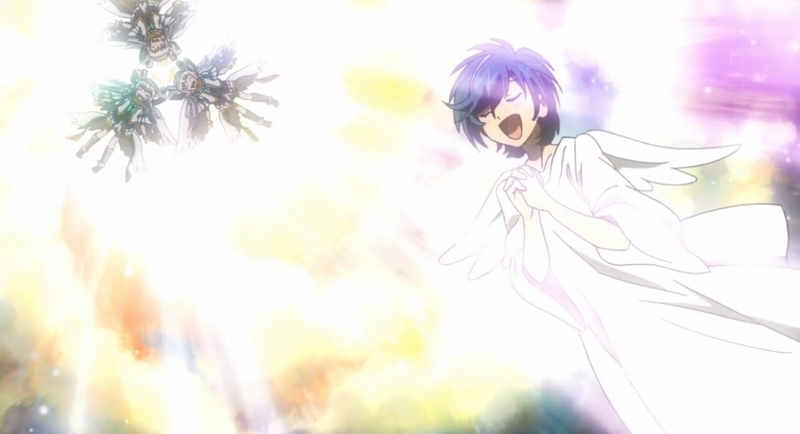 In any case, Chrono and his team are doing Okay and it seems that Tokoha´s and Shion´s one are doing good too. Suddenly Chrono is intercepted by a trio, team Neo Nippon. The ones who have inherited the will of the legendary Team Nippon made by Rive (Chrono´s Dad), Shin (Mizaki´s Uncle) and Ninja Master M (A Gaijin)! So the leader will face Chrono! The son of the former leader of team Nippon! The Match starts and while it made it´s job it truly some turns took too long to be completed and some scenes where unnecessary long, still some moments where enjoyable. In any case Chrono wins and when the time is up, only one team has enough points as of right now: Diffrider, lead by Kazumi, who also defeated both Tokoha and Shion. Some very solid chapters this time around! It is nice to see that Kazuma finally stoped being a whiny person and now is a respectable member of team Drifters! Also most of these chapters where centered on his development as a character and we have get some answers regarding his past; still it is very obvious that not all of him has been disclosed and that is very interesting. Regarding the other characters well… They didn´t got too much development; but we will see them at some point, so no worries from my part! Now finally we got a lot of funny moments especially in chapter 14 which made laugh a lot! Especially for the detail in the quality of the draws regarding such scenes! Truly magnificent! Oh also forgot to mention that Kazumi… He is a force to reckon with! I mean he defeated Chrono, Tokoha and Shion; when such notice came in the chapter I literally said “He can´t be human”, so yeah I have a theory that maybe he has something like Psyqualia, the weird (and addictive) ability that Ren and Aichi got back in the original series. Oh also the new ending is truly epic! ARE YOU READY TO FIGHT! Anyway That is all and see ya in 5 or so weeks!